Children too poor to own a store-bought toy are being given automatic rifles to train as child soldiers for Boko Haram, an Islamic terrorist faction that operates primarily in northeastern Nigeria. 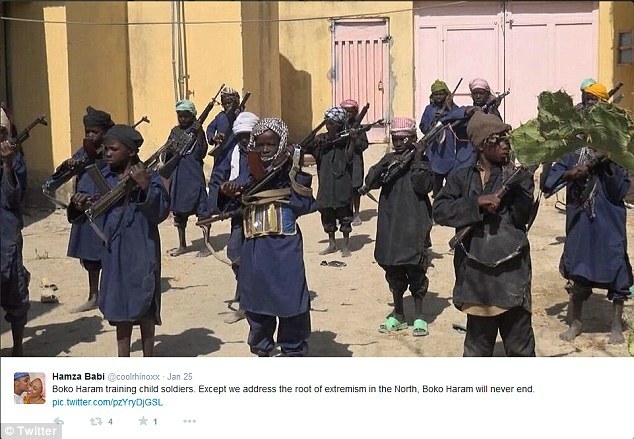 The jihadist group’s media arm recently posted two photos purporting to show a child soldier training camp with youngsters smartly dressed in blue and black clothing—in contrast to many Nigerian children’s mix-matched and tattered garments. Boko Haram calls these children, “the cubs of the Caliphate,” a phrase originated by the Islamic State of Iraq and Syria (ISIS) to describe their child soldiers. Boko Haram’s brutal tactics have discouraged recruitment of adult fighters, said Andrew Noakes, coordinator of the Nigeria Security Network, according to an article written by Jack Moore for Newsweek.com. Boko Haram “is fighting to overthrow the [Nigerian] government and create an Islamic state. The first word in its informal name, Boko, originally meant “fake,” but came to signify Western education. Attacks on police stations and other government buildings in 2009 in Maiduguri led to shootouts, with police ultimately capturing the Islamic faction’s headquarters and killing its leader. Abubakar Shekau emerged to lead Boko Haram and under his watch the number, frequency and ferocity of its attacks has surged. The United States designated it a terrorist organization in 2013, the same year the Nigerian government declared a state of emergency in the region. In August 2014 Shekau declared a caliphate in areas under Boko Haram’s control and praised Abu Bakr al-Baghdadi, leader of ISIS and self-declared caliph—ruler—of Muslims worldwide. “We are in an Islamic caliphate,” Shekau said at that time, flanked by masked fighters and carrying a machine gun.